By the time I started college at Penn State in the early 60’s, the Viet Nam war was looming. I had a student deferment. But when I graduated in 1968 with a Master’s in meteorology, I lost that deferment. At the time there was considerable DoD funding in weather modification and, since my specialty was cloud physics and cloud modeling, the Air Force and Navy presented obvious employment opportunities. Long story short, I accepted a job at the Navy Weather Research Facility (NWRF) in Norfolk, Virginia. I got there in late summer, 1968. When I arrived, there were a number of other new employees (all males) of my age. All had received military deferments from their draft boards because of the work they were doing at NWRF. Our Commanding Officer, CAPT (that’s Navy, not Air Force) Willis L. “Slim” Somervell, Jr. was a force unto himself. Towering well over six feet, he was physically imposing, but no less commanding in his words. This being true, I doubt that either of these qualities had been necessary in getting deferments for his scientists—mostly because our work was indeed relevant to war efforts. As a result, NWRF made its standard request to my draft board for my deferment. To everyone’s surprise, it came back rejected. No scientist at NWRF had ever been rejected! Responding to this rejection—and not used to being told NO—CAPT Somervell seized control of the situation and fired off a letter to my draft board. He explained, in no uncertain terms, that they should grant my deferment. I kid you not when I say that this is probably the most impressive letter anyone has ever written about me. If you read this letter (five pages, single-spaced), you will come to only one conclusion: IF THE DRAFT BOARD DECLINED MY DEFERMENT—AND WE LOST THE WAR IN VIET NAM—IT WOULD BE THEIR FAULT. That should do it, I figured. No siree, Bob! The draft board replied, in essence telling CAPT Somervell where he could put his letter. At this point, I was getting worried! But, I had one last local appeal. I could appear personally before my draft board, explain my work, and make my case. I drove back from Norfolk to Pennsylvania, did so, but was rejected again. Luckily, I still had one further option. I could appeal to the state Selective Service board (Pennsylvania). This time it worked. Hallelujah! The state board overruled the local board, and I had my deferment. Fast-forward one year, when my deferment needed renewing. I figured I’m sitting pretty, what with the state’s prior approval. SURELY, the local board would take the state’s decision as a precedent and accept their wise advice! Nope! They reject me again. But, me worry? Course not! I knew I had the State of Pennsylvania on my side from the previous year. Knowing that they had overridden the local board the first time around, they had created a precedent. But, inexplicably, they ruled against me this time. At this point, the situation looked grim, and I began looking at my military options. But to leave no stone unturned, I called the state board on the telephone (remember, this was 47 years ago) and asked if there was any possible further appeal available to me. They said that they were sorry, but that I had reached the end of the line. CASE CLOSED! Because my draft lottery number was not that high, I needed to act quickly if I wanted to avoid the draft. Long story short, because of my meteorological forecasting training, I joined the Air National Guard and went to Lackland Air Force Base to go through basic training as an enlisted man. Wait for it! Wait for it! While I’m going through my six weeks of hell in 100-degree heat, one day I received a call from my roommate, Doug Downen, back in Virginia (I had decided to keep my apartment until I returned). He told me that I had received a letter from the Selective Service System and wondered if he should open it. “Yes, please.” The letter stated that my deferment request had been sent on to the President. YOU HAVE GOT TO BE KIDDING ME!! I HAD BEEN ASSURED THAT ALL OF MY APPEALS HAD BEEN EXHAUSTED! Having joined the Guard because I had been told that all appeal options had been exhausted, I began praying that this appeal be rejected—so as not to have made my joining the guard unnecessary. But not long after I returned home to Virginia, I received a final letter from the Selective Service System. The President had approved my deferment. I explored ways of undoing my enlistment, but it was too late. I was officially in the Air National Guard. 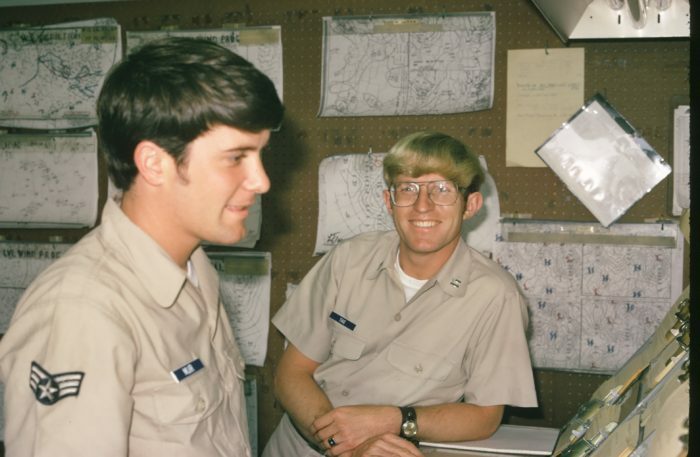 Epilogue One: After I returned from basic training, I was assigned to be a weather forecaster at the 121st Weather Flight at Andrews Air Force Base in Washington, DC. It wasn’t long before I was given a direct commission to First Lieutenant. When I moved to California, I transferred to the 195th Weather Flight in Van Nuys (southern California) unit. I was promoted to Captain. After my six years, I had the difficult decision of deciding whether to stay in the Guard or leave. I concluded that the advantages of staying in about equaled those of leaving. Had I stayed in, I would shortly have been promoted to Major. Ultimately, I decided to leave because at that point my PhD was within reach, and I did not want to risk that by being called to active duty. Epilogue Two: After all these years of reflection, I can honestly say that I’m glad that I did not receive the Presidential “pardon” in time. My experiences in the Guard were truly memorable. More important, I made great friends and have many stories to tell. For example, had I not gone to Van Nuys, I would not have met Ted Napolitano (fellow forecaster) and his wife, Pam—the latter of whom stood in line with me and my brother Fred in 1978 for SIX hours to be among the first to ride what was for many years the highest (nearly 13 stories), fastest (62 mph) wooden roller coaster in the world, the Colossus at Magic Mountain. As well, I never would have met Herb Wilkinson, our Commanding Officer and his wife, Lynn. Herb, Lynn, Becky, and I took four vacations together. He was also the one who introduced me to magic and sponsored me for membership into the Magic Castle in Hollywood. In life, we sometimes encounter an unexpected detour. And, sometimes, the sights along that detour create some of our most memorable experiences. It was a informative and interesting memoir. I liked this story especially what you took from it. Thanks for sharing, Paul.